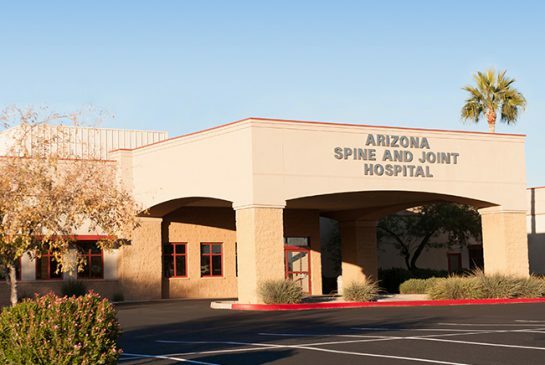 Established in 2002, Arizona Spine & Joint Hospital is an award-winning, physician owned & operated, orthopedic specialty hospital. Our staff provides high quality care in an environment that promotes wellness and rapid recovery. With 4 operating rooms and 2 pain treatment rooms, our 23-bed facility provides patients with the latest technology and all the ancillary services associated with larger, full-service hospitals. Look forward to great food! The hospital’s food service is provided by a Professional Chef. We think you will find both the quality and selection of food served is excellent. Meals will be served in your room. You will be visited by a member of the hospital’s food service staff each day to make your meal selections. Clinical dietary services are provided by a registered clinical dietician who will ensure that any special diets or foods ordered by your doctor meet your needs. Meals may also be ordered for a guest. Please let your nurse or food service personnel know if you plan to have a visitor at meal time. Please consult your nurse for authorization before consuming foods other than those served by the hospital. If you have special dietary needs, please make sure we are aware of them as we plan for your admission. To promote good health and rapid recovery, smoking is not permitted on our campus. If you smoke, your doctor may need to prescribe a smokeless nicotine substitute such as a patch or gum while you are in the hospital. The hospitals’ nursing staff will provide you information on smoking cessation programs available in the community at your request. Convenient off-street parking designated specifically for disabled persons. This parking is available adjacent to all public access doors. Level access into the facility. This facility has no elevators or stairways leading to service areas above the ground level floor. Fully accessible offices, meeting rooms, bathrooms, public waiting areas, patient treatment areas including patient rooms and examination rooms, and other public facilities. Qualified sign language interpreters for the deaf. A twenty-four hour telecommunication device for the deaf (TTY/TDD). Accessible TTY/TDD devices for patients and other customers. Readers and/or taped materials for the blind and large print materials for the visually impaired. Flash cards, alphabet boards and other communications tools. Assist devices for persons with impaired manual skills. The Centers for Disease Control has recommended that hospitals institute “Standard Precautions” for the protection of patients and staff against transmission of communicable diseases. These precautions involve the use of protective equipment by the staff when handling blood and body fluids during the care of all patients. You may notice our staff wearing some protective apparel, depending on the type of care being given to you. We want you to know that this is part of our routine and to assure you are comfortable that these protective measures are being followed for your protection. For questions, call us today at 480-832-4770.